Big, firm tomatoes which can be stuffed with any of the things, but I personally prefer cheese. And the cheese I use is made at home, because in this recipe, you won't need firm cheese, but only crumbled. We use lactose free milk at home because my hubby is lactose intolerant. So I just add lemon juice to a pot of boiling milk to curdle it and sieve it to get the crumbled cheese which I use for the stuffing. I feel it's fresh and safely made, and healthier of course. The stuffing can be from mashed boiled potatoes to a mixture of boiled potatoes, carrots and peas; combinations of one or two can be done; or just about anything else that can be made in a paste form to be used as a stuffing. I personally don't like to experiment with some things, because I like them a particular way, but experimenting is always fun, isn't it? So here goes my recipe with cheese filling which can be grated as well for the stuffing if it is store-brought. Take the tomatoes and wash them thoroughly. Then carefully cut off the top and scoop out the insides of all the tomatoes with a blunt knife. The tomatoes will now be hollow. Don't throw the scooped out tomato insides, keep them in a bowl for further use. Next, take 1/2 litre water in a container and boil it on high. Put the tomatoes in the boiling water, let it remain for about a minute and turn off the heat. Remove tomatoes from the boiling water and put them in ice-chilled water. The tomato skin will rupture and then remove the top skin of the tomatoes manually very carefully, without disturbing the tomatoes. The tomatoes must remain firm. Do not boil more than a minute, it will cause the tomatoes to go soft and difficult to make. Keep them aside. Take the grated paneer in a bowl and add all the dry spices to it, red chilli powder, mango powder, cumin powder, garam masala, coriander powder and salt to taste. Mix well and fill all the tomatoes with this paste to the top. Press it well so it is filled completely. Keep aside. In a shallow pan, add oil and let it heat on medium flame. When hot, add cumin seeds and let it splutter. Add chopped onions and sauté them till they are transparent. Don't let them brown. Then add chopped garlic. Saute it for 10-15 seconds. Then add chopped tomatoes, green chilli and ginger. Cook it for a while and then add red chilli powder, turmeric powder and salt to taste. Let it cook and let the tomatoes become soft. Then add all the stuffed tomatoes one by one carefully in the pan, filled side up. Let it cook for about 30 seconds, and then turn it to all sides and bottom and keep at each side for about 5-10 seconds. When mixed thoroughly with the masala, straighten them, turn off the flame and sprinkle some garam masala and kasuri methi powder on them. 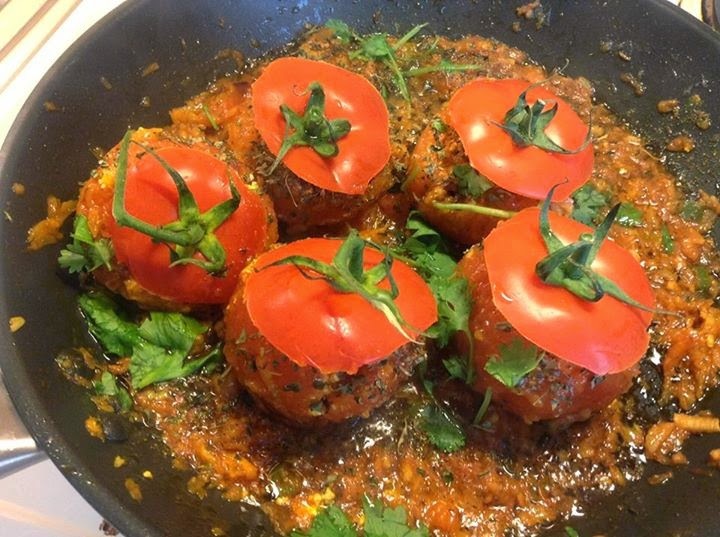 Cover all tomatoes with their tops, garnish with fresh chopped coriander leaves and serve hot with chappati (Indian flatbread) or jeera/plain rice. Hi, I can't see the recipe for this one in your blog. Could you please paste the recipe link for me.